Tesco PLC, the British transnational grocery and general merchandise retailer, has entered the Pakistani market with a bang after joining hands with Karachi-based Alpha Supermarket. “United Kingdom’s brands, especially those as big as Tesco, have a real advantage in Pakistan as they are already recognisable to the people, who have visited Britain,” British High Commissioner Thomas Drew said after inaugurating Tesco label products with Limestone Private Limited at the British Deputy High Commission in Karachi. “At the heart of this will be increased trade between our two countries and I hope Tesco's launch is just the start of a new era of British Pakistani trade.” Drew added this is a particularly important year for this to be happening in Pakistan as the two countries are celebrating 70 years of mutual relations. “While we will of course be remembering all the things that have linked us over the last 70 years we are just as focused on the future of our relationship,” the British diplomat said. Speaking on the occasion, Nadeem Hussain, Chairman of Limestone Limestone Private said the company plans to open 50 Express Stores with Tesco products across Pakistan over the next three years, in addition to flagship stores in Karachi, Lahore and Islamabad. “Limestone plans to distribute the label all over Pakistan through its distribution network,” Hussain said. He noted that Planet N Group of Companies is honoured to bring a global brand like Tesco to Pakistan. “We intend to leverage this relationship by creating Alpha Express Stores across the country in short order,” said Hussain while vowing to make all Tesco products available on their e-commerce platform. In her address, Belinda Lewis, the British Deputy High Commissioner and UK Director for Trade, told the audience the Department of International Trade has worked closely with the teams from Tesco and Limestone to support Tesco private brand’s entry into the Pakistani market. “It’s exciting to see such a major UK brand being launched in Pakistan, and reflects the growing consumer market here,” she said. According to the statement, Alpha Supermarket will be offering Tesco products in the following three categories: Tesco Goodness, Tesco Finest, and Tesco Everyday. Reports have it the company has already invested $2 million mainly in its Karachi’s store and it believes the investments will double in the next coming months. 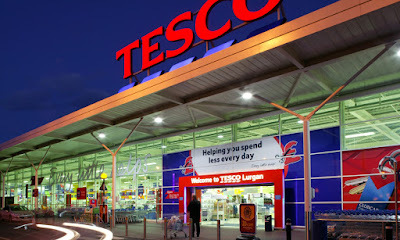 Tesco is the third largest retailer in the world measured by profits and fifth-largest retailer in the world measured by revenues. It is also the second biggest employer after the UK government. The retailer has also significantly enhanced up to 38 percent. It has stores in 12 countries across Asia and Europe and is the grocery market leader in the UK (where it has a market share of around 28.4 percent), Ireland, Hungary, Malaysia and Thailand. Report by The News International.